This entry was posted in tax, Uncategorized and tagged 5Rs of tax, post-2015, targets, tax, the Palma by Alex Cobham. Bookmark the permalink. Very interesting piece indeed Alex. One question on the tax/total revenue indicator of relevance to resource rich countries. Some resource revenue actually appears in the disguise of taxes (mainly corporate income tax but also in a variety of other taxes) but there seems to be a growing recognition that all revenues derived from natural resource exploitation should be classified as such regardless of the instrument government uses to collect it. This is an issue that is recognised in the GFSM2014 and deeper spin-off work done in colaboration between the IMF and EITI to strengthen classification of resource revenues in the PFM system. (This raises issues about where to draw the line between tax and revenue resources (e.g. income tax of employees in oil or mining) akin to the flaws of the PwC total tax contribution – but that is a different discussion). Wouldn’t this issue also affect the tax/total revenue ratio making it appear better than it is if not distinguising between resource revenue received as tax and “traditional” tax revenues? Thanks, this is an important issue for almost any tax ratio. Mislabelled resource revenues distort measures of tax performance and of TNC tax compliance alike. As you say, the IMF is putting more emphasis on getting this right now. I’m biased, but at the moment at least I would say the ICTD Government Revenue Dataset offers the best data on this, because of the work that has been done to use all available data and to get this particular point right. Even here though, the caution you suggest is still needed – sometimes it’s impossible to find a historical source for the split, so we just need to be careful in evaluating tax performance of resource-rich countries. Just preparing a lecture on FfD and came across these itneresting graphs. One quick q: in the graph on Tax/GDP ratio the data for East and South East Asia should be the data for the OECD, right? 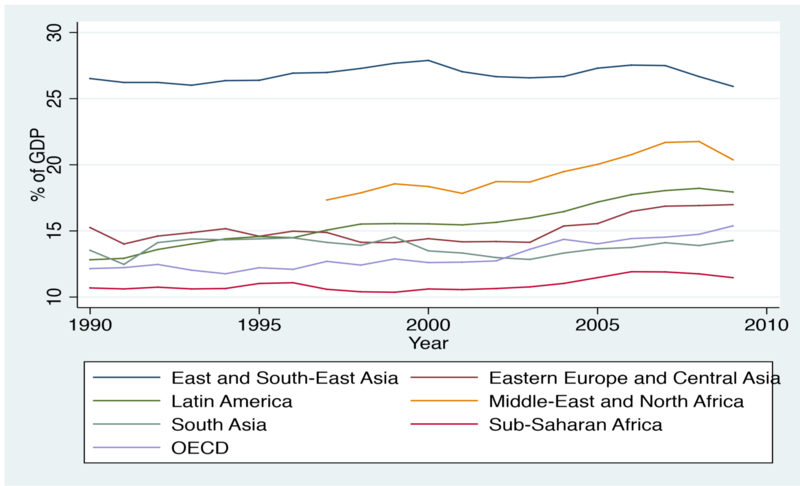 (according to the graph, the tax pressure in OECD countries is slightly over the SubSaharan countries). You’re absolutely right, now sure how I scrambled that – thanks Iñigo.